This demo shows off how Pixel Vision 8's SpriteChip works. The SpriteChip handles rendering each 8 x 8 pixel sprite on the screen. The demo shows off each of Pixel Vision 8's drawing APIs and how to use multiple sprites to create more complex visuals. 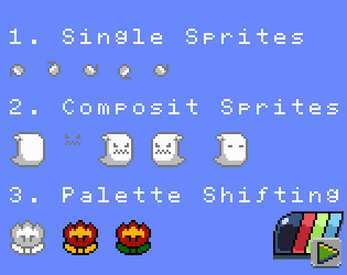 It also shows off how palette shifting works and drawing sprites above and below the background layer.